If the Associated Press is to be believed, the NYPD rank and file did a major about-face between the funerals of slain Officers Rafael Ramos and Wenjian Liu. According to the AP, “New York Mayor Bill de Blasio and Police Commissioner William Bratton have been saluted as they entered a funeral home for an officer’s wake. 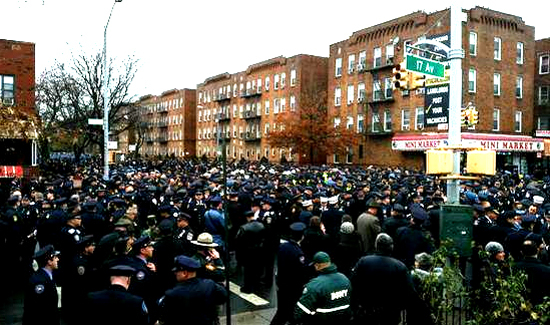 The action by officers Saturday at the wake of Wenjian Liu was in contrast to the hundreds of police who turned their backs to video screens showing the mayor speaking at last week’s funeral of Liu’s police partner, Rafael Ramos. According to the New York Times, which is still using humans to write the stories, the AP story isn’t accurate. They write: “Scores of officers in pressed blue uniforms—among thousands crowded in the rain outside the funeral of one of their own—turned their backs on Mayor Bill de Blasio as he delivered a eulogy on Sunday praising the slain officer as an example of a ‘brave’ and ‘kind’ New Yorker who came to New York from China and followed his dream to join the Police Department. If you’ve been on any police websites where people are talking about the NYPD protests of Mayor DeBlasio and Commissioner Bratton, you may have seen the tell-tale signs of a growing disagreement about behavior and decorum, in terms of what’s appropriate at the funerals of fallen peace officers.